Have you ever experienced a messy working day because of having no idea what to do or forgetting to do something? A job duties flowchart can do you a favor. This article will tell you what is a job duties flowchart and how to draw it, then introduce a great flowchart design program to you. Let’s take human resource personnel as an example. For a human resource personnel, his major job duties are as follow. Establish the rules & regulations of company and supervise & check the implementation. Design & improve the organization structure and distribute the human resource properly. Carry out job analysis and establish & perfect the post responsibility system. Responsible for personnel recruit and find the right talent for company. And job duties flowchart is kind of diagram aims to describe the systematic flow of the whole job duties and show relationship between the major parts of the duties. Look at your job at an objective way and list your daily duties step by step on the page. Select right vector symbols to text your daily duties in. Connect the steps with arrow according to their importance and correct order. Brainstorm to perfect the flowchart and keep updating. With this visual job duties flowchart, you can know more precisely what you need to do at work and improve your work efficiency. It can also increase your knowledge and value to your organization and yourself. Below is a simple job duties flowchart for you. 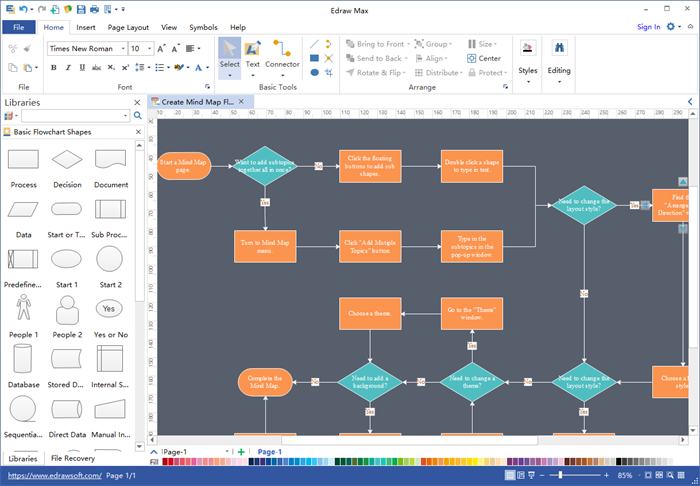 Flowchart Maker, as a great and popular flowchart design program, has many advantages better than most of other flowchart software. Firstly, Flowchart Maker is a cross-platform flowchart design program, which is compatible with Windows, MAC OS X and Linux systems. Secondly, it has a large variety of built-in vector symbols and flowchart templates for flowchart making, you just need drag-and-drop some of symbols or templates, then you can get a marvelous flowchart within several mouse clicks. It enables even a green hand to create a professional-looking flowchart easily. Thirdly, Flowchart Maker supports many formats transferring. You can transfer your flowcharts into Word, Excel, PowerPoint, PDF, SVG and transparent PNG format with just a click. Then you do not need worry about that your colleagues or friends could not open the flowchart you draw. 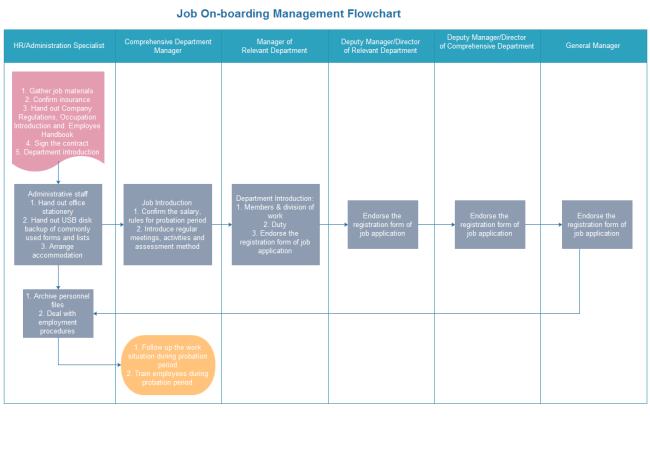 Below is another flowchart example showing the job on-boarding process.